I like to express myself through cooking, although unfortunately I can’t claim the ability to create recipes. I find good ones and use them. Taking cooking classes extended my repertoire. 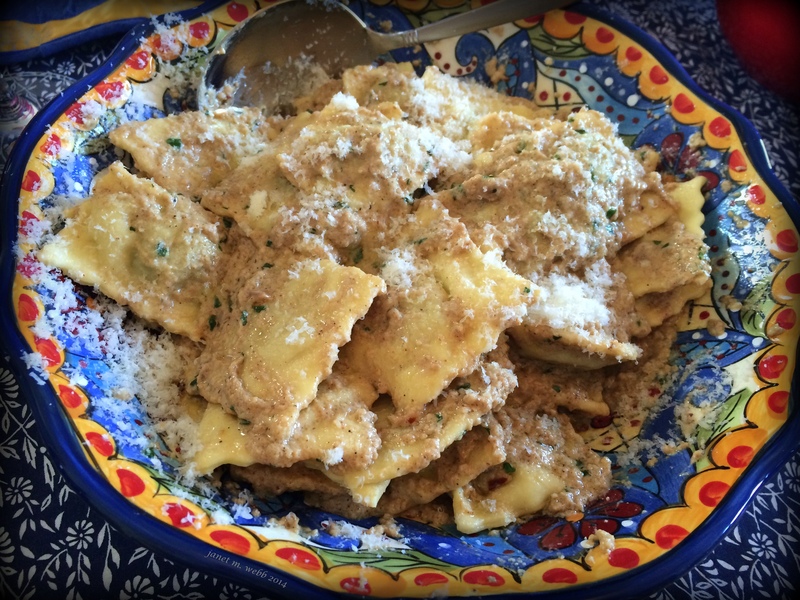 The favorite recipe to come from the classes is homemade ravioli with walnut sauce. The sauce comes from an Italian grandmother (not mine) and gilds the lily or, in this case, the ravioli. This the dish demanded for all major holidays and not difficult to make, although it’s a bit time-consuming. But there’s something satisfying in making it and in eating it! This week I have very, very limited internet, but I’ll do my best to visit as many of your posts as possible. Thanks for letting me know! I’d love to have ravioli with truffles.! Enjoy. Definitely! You’ll have to give it a try. The sauce would be good on other pasta, too. Hmmm, hadn’t thought past pasta. Good ideas. Delicious. I just finished my risotto, but I love to taste the ravioli. I love risotto, too, Jaap! Yum! It’s amazing and very simple to make. Oh my Janet – I want to dive into this dish……:) yum. Best way of expressing yourself. Food. I just love food. It is and the sauce is simple to make. Looks (and I am sure also tastes) really delicious, Janet! Janet this looks fabulous! My intent is also very bad! Mmmmm looks absolutely fabulous Janet! I love to cook too!! Give that sauce a try, Nicole. It’s delish. Looks very delicious, and not too kind to my waistline. But we only live once! Good interpretation of the theme. Nice to see you, Theadora. I don’t have much internet right now so i haven’t gotten to your latest post. 😢. No special story on the bowl except that I found it on sale and loved it. It’s just the right size for the ravioli and so colorful. That’s great and perfect for theme and now I’m hungry…. :-). Stop by at Easter. Looks delicious Janet, and definitely a means of self-expression. I must admit I get really bored making the same old thing so often, but then again, I must also admit I am not one to take the time and make the effort to learn new dishes. What I REALLY need is a live-in chef 🙂 That will be my first purchase after my private plane when I win the lottery !! !